ZeniMax Online recently called in to the Game Informer podcast to talk up its Elder Scrolls Online title. Game director Matt Firor and creative director Paul Sage were the devs of record, and the 30-minute chat featured some interesting tidbits. Firor mentions that the game will release simultaneously on PC and Mac, but ZeniMax has no plans for a console version. Sage talked a bit about the progression system, which, while level-based, does feature skill-based advancement as well. In the current build, characters gain experience in skills that are slotted. Sage also mentions that you do get better with weapons as you wield them, though the gain is not 100 percent usage-based. There’s also a bit of discussion about art style, camera modes, and the decision to MMOify the Elder Scrolls IP. “We’re making an MMO; we’re unapologetic about that. This is the Elder Scrolls MMO. It’s not Skyrim. Skyrim already exists, and you can go play Skyrim. 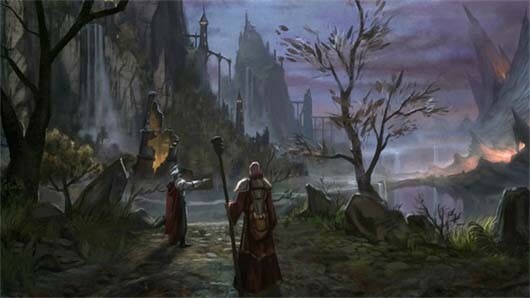 We’re making the MMO version of the Elder Scrolls, and with that comes some conventions that are different from a console RPG,” Firor says. However, I would have preferred that instead of an MMO, a single-player with coop capabilities across the traditional LAN, over the internet with IP, or even GameSpy Arcade would have been better. I’ve been finding that MMO’s seem to take substantial significant chunks out of games that were previously not MMO. I just hope that they don’t take anything out, which of course they will, and I hope they make it so that we can set up our own little game and play with our friends without being forced to connect to specific servers like most MMO’s do it.